Join the David J. Raleigh Quartet, including Tony Carfora/sax, Daniel Glass/drums, and Danny Weller/bass and me as we take a journey through New York’s musical history, weaving personal recollections of New York with the songs of the composers and artists who for years have paid homage to the city they call home. You’ll hear the music of the Gershwins, Jerome Kern and Cole Porter, which evokes the high life of the thirties…tuxedos and top hats, jazz and cocktails. But there was another side of the 1930s, the life and struggles of the common man. You’ll hear that music as well. 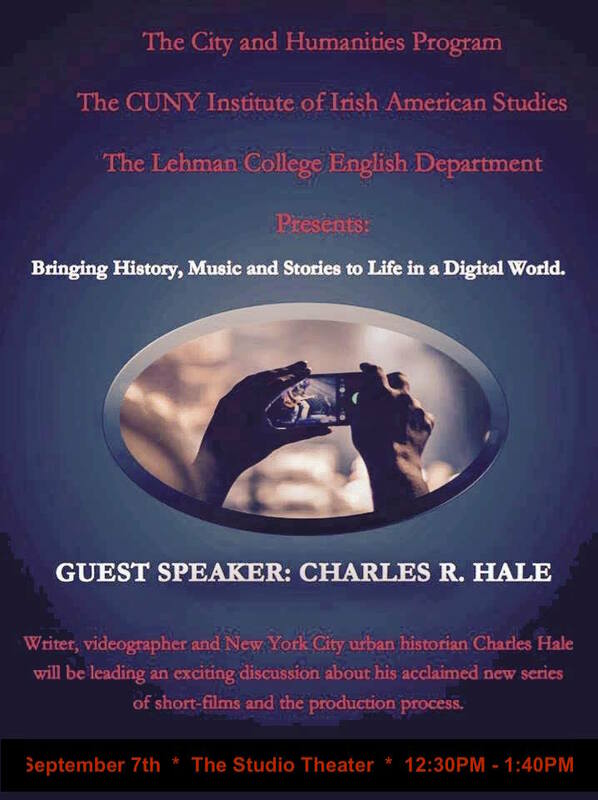 Charles R. Hale will be presenting “Bringing History, Music and Stories to Life in a Digital World,” at Lehman College on Thursday, September 7th, 12:30pm, in the Studio Theatre at Lehman College in the Bronx. This is a free event. For directions, to the Studio Theatre, which is located in the Speech and Theatre Building on the Lower Level at Lehman College, click here. Join David Raleigh and me at Lehman College this Thursday, November 29th, 12:30pm, for our 26th presentation of Jazz in the City: The New York Connection, a show that has been performed at The Cell, The Triad, The Duplex Cabaret and Piano Bar, The American Irish Historical Societyand Lehman College. Jazz and the City features the stories and songs of the artists and composers who for the past 375 years have paid homage to city they call home. Many of their songs were popularized in New York’s venues such as the Village Vanguard where Miles, Mingus and Monk performed and venues that are long gone and Cafe Society where Billy Holiday debuted “Strange Fruit.” And then there are the stories and songs that I associate with New York through ancestral, familial and personal recollections. And how fortunate am I to be performing with four incredible musicians, David, Tony Carfora, Danny Weller and Daniel Glass.